As you are probably aware by now, we have a Bailey Senator Indiana Series 6 which, we think, has a great layout and many excellent features. 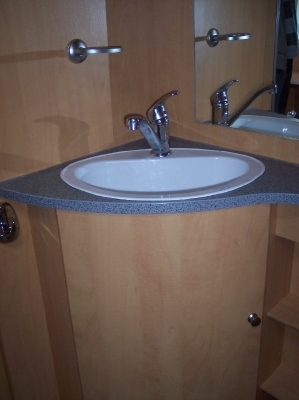 Below we list some of the best features and show you some pictures we have taken of our caravan. See what you think of our Indiana! This shows the layout of the Indiana - with the front lounge, middle kitchen, end fixed bed with toilet and shower to the side. This is a brilliant layout if you don't like packing away beds every day. The front single beds are long enough for our children (then aged 11 and 14) to use without having to make them up. The front two beds can also be made into a double bed using the pull-out wooden slats under the front chest. All bedding can be stored on the fixed bed during the day. 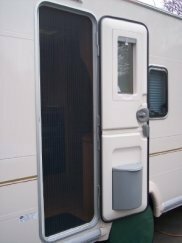 The door on the Bailey Senator Indiana is a stable-type door with a double glazed window and blind. The door also houses an integral waste bin. There is also a full height pleated door flyscreen. All side windows have a pleated blind and fly screen fitted, as well as curtains. The front windows have normal pull-down blinds and flyscreens plus curtains. This picture shows the two front sofas together with the lockers and sunroof. As you can see, we always cover our sofas as we have a dog who likes to get muddy and sandy!! The sunroof is a tilting sunroof with a ceiling lighting surround and flyscreen and blind built in. Under the left front sofa is an extremely large and useful pull-out drawer. A super storage space which is extremely accessible - Well done Bailey Caravans!! This picture shows the sideboard on the right of the caravan door. There is a microwave above which comes in very handy. The blind allows you to close off the bedroom at night. Above this is the TV which can be swivelled around to face either the lounge or bedroom. 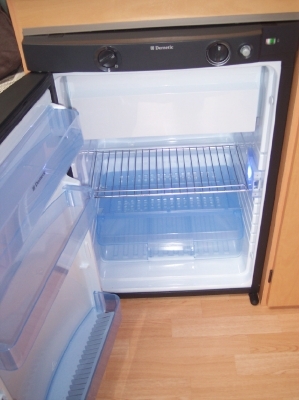 The fridge is a large 115 litre with electronic ignition and removable full-width freezer compartment. It also has “space-age” LED lighting which looks great at night! 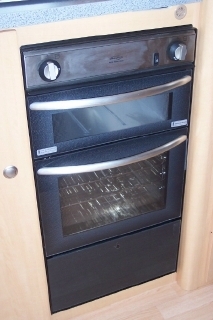 The oven has a main compartment as well as a grill section. Above this is the 4-burner gas hob unit with a flush fitting hinged glass lid. We have made a wooden cover for this as we don’t often use the gas hob (see our Caravan Tips page for more details) and the cover allows us to use this space for the kettle and toaster without damaging the glass lid. 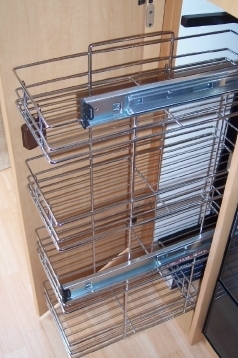 Next to the fridge and cooker is the extremely useful and spacious pull-out larder cupboard. This cupboard also houses the folding leaf free-standing table. 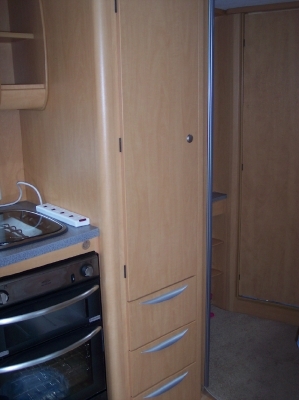 As you can see, this cupboard can house rather a lot of food or anything you wish to store in the caravan. A very clever and practical unit. The TV, which is included in the price of the Senator Indiana, is mounted on a swivel panel, allowing you to have the TV either facing the lounge or bedroom. 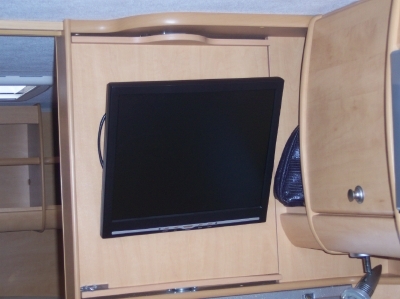 This TV is connected to the radio in the caravan on which you can watch DVD's (the only downside is that the sound still comes out from the speakers at the front of the caravan which is rather a long way away if you are watching the DVD in the bedroom!). Our TV has just decided to work intermittently (very annoying when you are waiting to watch the last episode in this series of Torchwood!!!) so we have taken it back to our local dealer who is arranging for the fault to be rectified. This is the radio which is situated to the left as you walk in the door. 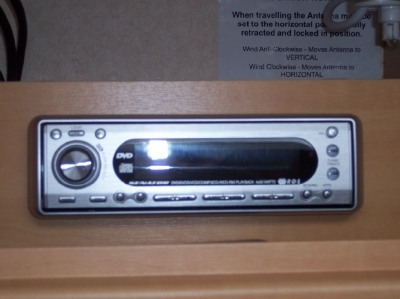 As we said above, it also allows you to play DVD's on the TV, as well as playing CD's and the radio. This is the wardrobe which can get pretty packed with clothes with four people staying in the caravan. There are three drawers underneath for more storage, and the drawers all have a self-closing mechanism. 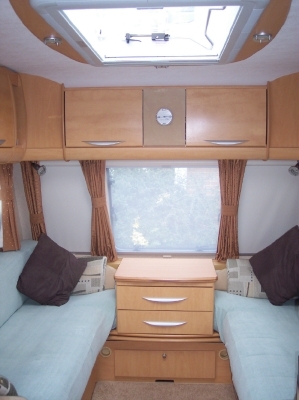 The fixed bed in our Bailey Senator Indiana caravan is extremely comfortable. 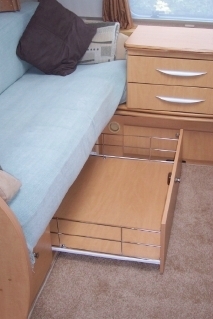 It lifts up to reveal a huge storage compartment underneath which is also accessible from a hatch outside the caravan. There are two spotlights and corner shelves in the bedroom. The bathroom sink is situated in the corner of the bedroom with a mirror fixed over the top. There is a cupboard for storage underneath as well as shelves to the side for all your cosmetic bits and bobs. The toilet and shower are to the side of the bed. The toilet is a swivel bowl electric flush cassette toilet. 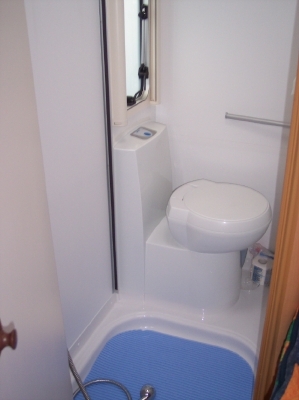 The toilet is easily emptied as the waste container has a pull along handle and wheels!! Next to the toilet is a heated towel rail - very useful for drying towels. There is a folding shower door which fully separates the toilet from the shower compartment when you want to use the shower. 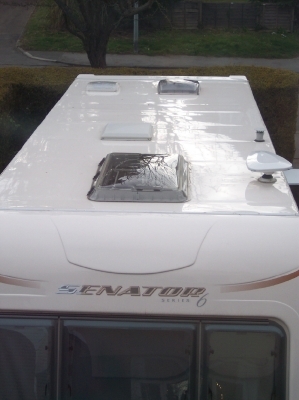 This is a picture of the caravan roof which shows all the roof lights. As we have said above, there is a large tilting sunroof over the lounge at the front. 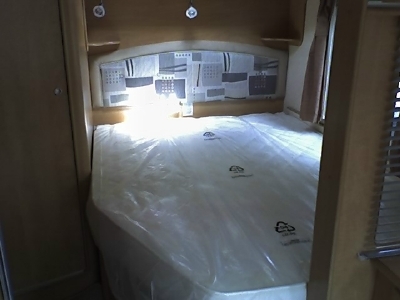 There is also a smaller sunroof situated over the bed at the back of the caravan. In the middle is the omnivent which will remove any steam or smells when you are cooking. Over the shower is a roofvent to let out any moisture or steam after showering. You can also see the Status telescopic directional television aerial on the roof. We always use a separate digital aerial (fixed to the front A-frame) which allows us to receive Freeview. 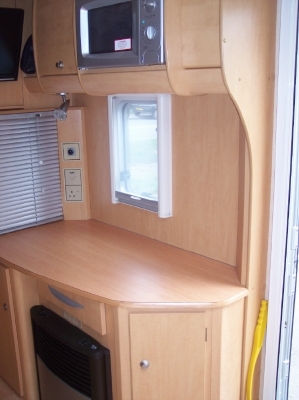 These are just some of the features of a Bailey Senator Indiana Series 6 caravan. If you like the sound of our caravan just contact your local Bailey caravan dealer or go to www.baileyofbristol.co.uk for more information. CLICK HERE to let us know what you like about our Bailey Senator Indiana caravan, or send us a review of your caravan to add to this website.